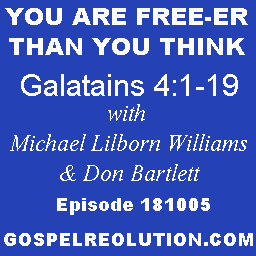 On this week’s power-packed Powercast, Michael and Don address the whole issue of freedom. Can we be too “free”? The fellas also eulogize the late, great Ted Winsett. I will always hit the “like” button. Didn’t know it would help. Great teaching as always. We should all go back to all the old teachings and hit “like” right? I will. Christianity can not preach the Gospel and be the booming business that it is. I never saw that the apostles ( disciples? ) fought the grace message Paul was preaching. I see it now. We love that we can disagree here. So as for world wide peace if we all knew the Gospel, which was just a quick thought and statement, not ministry doctrine here, it still won’t happen. There are Christian ministers who already know the Gospel and will not preach it and a million years out there will be other filthy snakes perverting the truth for financial gain who won’t preach it. I’m still waiting to see some hot shot Christian TV minister grow a severed limb out. . . Been decades of teachings and gillions of dollars earned in book and CD sales on “how to one up Jesus or fool and bribe God into giving it to you” yet none of them has grown out the limb. If the supporters of Christianity will not insist on accountability from the ministry, they are stupid. Don’t be upset at my comment, grow the limb out or hush. The gospel just keeps getting “gooder and gooder”!! Thanks for all your hard work in studying and sharing! Ia a communicating with someone who doesn’t understand why God would create man knowing they would fail and then come and rescue them?? I tried to exlain that it was part of the plan for God to become one with us more than it was a rescue from sin operation. Thanks for everything it so exciting!! !